improved their team hairstyle on deadline day? Another summer transfer window has come and gone and here we are. It's mid-September and we've got a critical clash against Manchester City at home. On the whole, you have to think Arsenal have improved on their squad from last year; the only glaring hole is the lack of depth at center back, but that talking point has been beaten to death already. "Preview by Numbers" is not a column for looking back on what Arsenal should or should not have done, either on or off the pitch. It's all about looking ahead at what to expect in each individual match. There's no better way to dive straight back into this stressful business than with the champions at home. On a personal note, I'll be in Philadelphia this weekend and our hotel is a convenient six-minute walk to their home pub. With the match being an early kickoff, yes, I planned it that way. 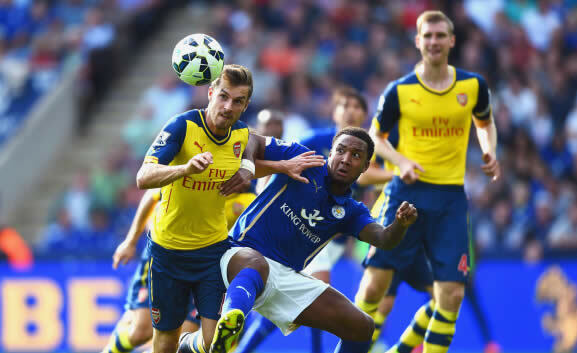 this Leicester player looks afraid of the ball. There's a lot of good news in the injury report this week, in addition to one bit of bad news; that bad news is that Aaron Ramsey is a doubt with an ankle injury he picked up on international duty this week, an injury Arsene Wenger has termed "minor." Even if it's minor, Wenger used the phrase "a little chance" when referring to Ramsey's availability, so it's best to prepare for a big match without the Welshman, especially considering the Gunners have a trip to Dortmund early this week. With that out of the way, there's plenty of good news. Mesut Ozil returned to full training on Wednesday; he missed Germany's international action after picking up an ankle injury at Leicester and he should be available tomorrow. Mikel Arteta, Kieran Gibbs, and Laurent Koscielny are all available again as well, having recovered from ankle, hamstring, and head injuries, respectively. Assuming Wenger sticks with this 4-1-4-1 formation he has suddenly adopted this year, I would expect Arteta to return to the holding role. If Wenger is still going to shunt Ozil out wide left (which I still hate,) then the rest of the midfield should look a bit like it did in the home match against Beskitas (when Ramsey was suspended,) with Jack Wilshere and Santi Cazorla in the middle. 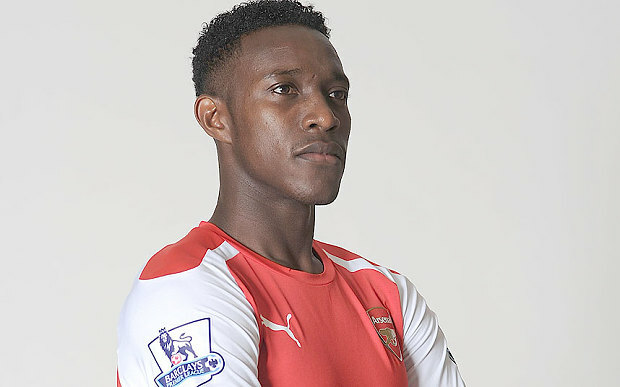 The introduction of Danny Welbeck, who scored twice for England in their first Euro qualifier against Switzerland, means that Alexis Sanchez can drop back to the right wing. Predicted XI: Szczesny, Debuchy, Koscielny, Mertesacker, Gibbs, Arteta, Wilshere, Ozil, Cazorla, Alexis, Welbeck. City may be without FERNANDOR, Destroyer of Souls. Striker Stevan Jovetic picked up a hamstring knock in training while with the Montenegrin national team and is listed as a doubt. Manuel Pellegrini will not like that he's had a hit to his numbers up top; while City of course have significant depth at essentially every position, it is that depth that allowed the club to send Alvaro Negredo on loan to Valencia. Without Jovetic, Pellegrini will just have to start Edin Dzeko up top alongside Sergio Aguero. Boo hoo. Pablo Zabaleta may not be risked with a knock, which would ever so conveniently allow Bacary Sagna to start at the Emirates. Meanwhile, Fernando left the Stoke City match with a groin injury and remains a doubt himself; Fernandinho (which, of course, means "little Fernando") would start in his place. Predicted XI: Hart, Kolarov, Kompany, Demichelis, Sagna, Fernandinho, Toure, Silva, Nasri, Dzeko, Aguero. 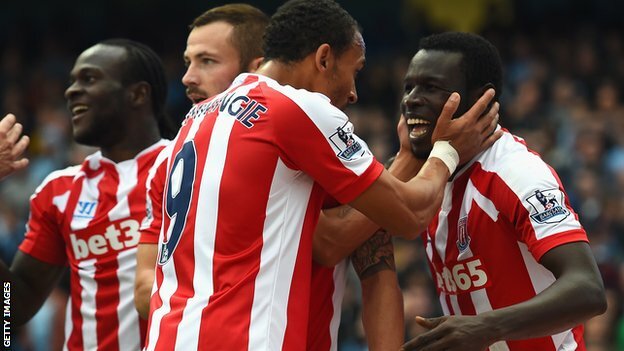 Get in, Stoke! I can't believe I had to say that! Despite the fact that Arsenal have labored through the start of this season, they still remain unbeaten in 2014/15; that unbeaten streak still spans both seasons, dating back to the 3-0 loss at Everton in early April, meaning the Gunners are unbeaten in their last 13 matches, across all competitions. At home in league play, Arsenal have not lost since last year's season opener against Aston Villa, a streak that has now reached 19 matches without defeat. Manchester City had won seven straight in the league, dating back to last season, before their 1-0 reversal against Stoke City at the Etihad just before the international break. Prior to that loss, City's previous league loss came 3-2 at Anfield in April; more on that in the referee section below. They had to scrape back to draw Sunderland in the midweek that followed before winning the final five matches of the year to claim the league title. Both clubs travel to Germany this week for Champions League football; Arsenal face Borussia Dortmund on Tuesday, while Manchester City face Bayern Munich on Wednesday. his equalizer in this fixture last year. Arsenal have already played Manchester City in a competitive fixture this season, winning the Community Shield by a convincing 3-0 scoreline. Say what you want about it being a glorified friendly and City playing their B-team, Arsenal still won the match by a wide margin. It remains by far the most impressive victory of the Arsenal season to date. In the league, however, Arsenal are without a win in their last four against Manchester City; in each of the last two seasons, the Gunners have drawn one and lost one to City. Last year, after a 6-3 reverse at the Etihad in December, Arsenal snatched a 1-1 draw from City at the Emirates in March. That match, played a week after Arsenal's 6-0 defeat at Stamford Bridge, saw City go ahead in the 18th minute through David Silva. Arsenal staged a spirited comeback in the second half, equalizing through Mathieu Flamini on 53 minutes. Arsenal's last win in the league over City came on Easter Sunday 2012, with Mikel Arteta scoring in the 87th minute. Manchester City won this fixture 2-0 in January 2013 after Laurent Koscielny was sent off in the 10th minute; that match was City's only league win against Arsenal in North London in their last 29 tries. Prior to 2013, City's last league win at Emirates/Highbury came on October 4, 1975 by a 3-2 scoreline. The referee is County Durham-based Mark Clattenburg. Arsenal have a remarkable record all-time with Clattenburg as referee, winning 21 out of 30 matches; they've lost seven and drawn two of the 30. Last year, Clattenburg was in the middle for the 2-1 win at Swansea, the 2-0 win over Southampton, the FA Cup wins over Tottenham and Everton, and the 0-0 draw with Manchester United.